Fewer Americans are participating in employer-sponsored defined benefit and defined contribution plans. In fact, according to a recent report from the New School’s Schwartz Center for Economic Policy Analysis, from 1999 through 2011, 53 percent of working Americans were not enrolled in a retirement plan at work — down from 61 percent. When you add in people who did not participate in a plan offered to them or who were not working, 68 percent of working-age people (25-64) did not participate in an employer-sponsored plan. According to the report, because of these low retirement plan enrollment numbers, 55% of U.S. households nearing retirement may have to rely on Social Security income exclusively for financial survival in retirement. The report, entitled Are U.S. Workers Ready for Retirement? Trends in Plan Sponsorship, Participation and Preparedness, was released in April and co-authored by Theresa Ghilarducci, a nationally recognized expert in retirement security. It found that of working-age Americans with an employer-sponsored retirement plan available to them, only 16 percent had a defined benefit plan, while 63 percent had a defined contribution plan such as a 401(k). In a comparison of net worth, the households who are enrolled in a defined benefit pension plan fare the best, with a median net worth of $116,973, compared to $107,250 for those in a defined contribution plan, and $4,450 for those without an employer-sponsored plan of any kind. Regrettably, as bleak and discouraging as this picture is, things could still be worse. According to the report, 33 percent of current workers aged 55 to 64 are likely to be poor or near-poor in retirement based on their current levels of retirement savings and total assets. While a sizable share of the retiree population will be at risk of living in poverty in all states, workers in Massachusetts and Virginia are more likely to enjoy a secure retirement than their counterparts nationally, with only 22 percent of workers 55 to 64 likely to be at-risk for a poor standard of living in retirement. 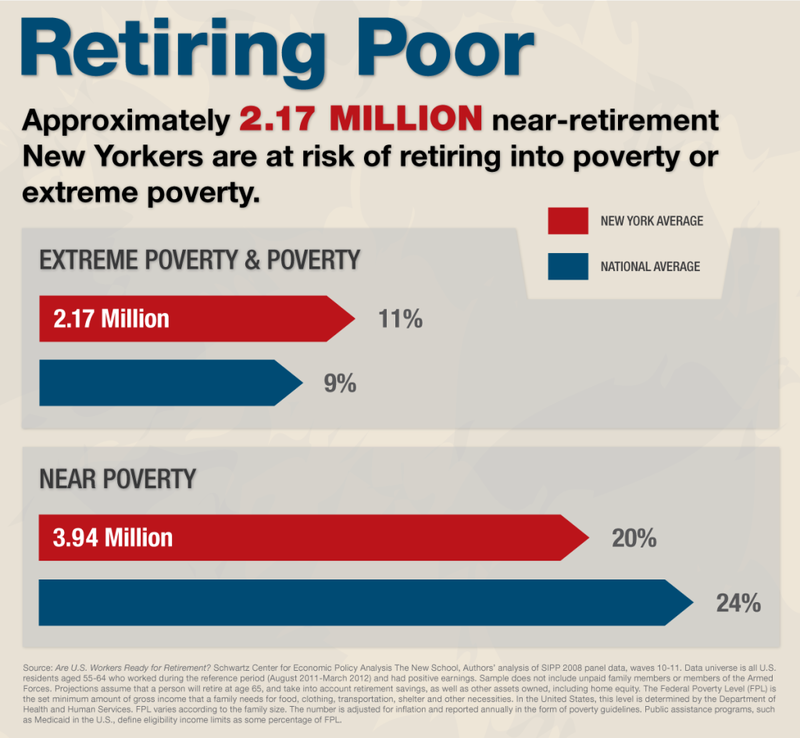 It’s a much more troubling story here in New York where 32 percent of near-retirement workers may experience poverty or near-poverty in retirement based on their current savings levels. New York State Comptroller Thomas P. DiNapoli, the administrator of the New York State and Local Retirement System (NYSLRS), has long addressed the topic of retirement security and said that policy makers and the community-at-large should be directing their energies to ensure retirement security for everyone, including workers in the private sector. Comptroller DiNapoli discusses this issue in remarks he delivered last June during a Retirement Summit at the Schwartz Center. Content last revised July 15, 2015. This entry was posted in General News, Members, Pension System, Retirees, Videos and tagged Comptroller Thomas P. DiNapoli, defined benefit plan, defined benefit plans, ERS, members, New York State & Local Retirement System, NYSLRS, PFRS, public pension system, Retirees, retirement security, Retirement Security Crisis, Social Security, this public pension system works on July 15, 2015 by NYSLRS.